We all know that color trends come and go. Neon itself has come and gone before. Last time we saw Neon as a trend though, it wasn't as much in our home interiors as it was on rad sunglasses, fanny packs, and other assorted really cool stuff in the 1980s. I will admit to writing a holiday wish list that included "really really really really bright pink socks and shorts and really really really really bright yellow socks and shorts." This time around, the Neon Trend is everywhere from countertops and cabinets to stand mixers to DIY tutorials about dipping the ends of wooden kitchen utensils in paint. 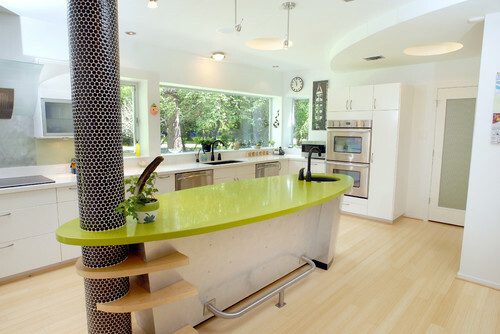 So how do you use neon tastefully in your kitchen or bath design, or is that even possible? We've all seen bright countertop materials from manufacturers like CaesarStone and Silestone, but what is the reality of using them in a home application? This kitchen uses kind of a futuristic-meets-classic take on the concept. 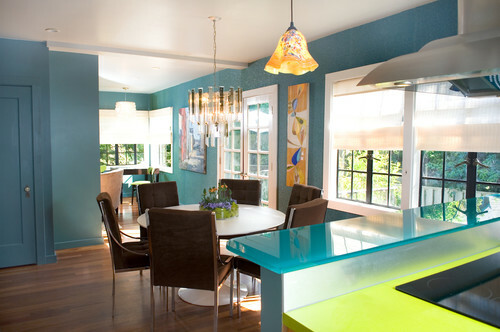 The design of the island combined with the color make it the statement piece of this kitchen. 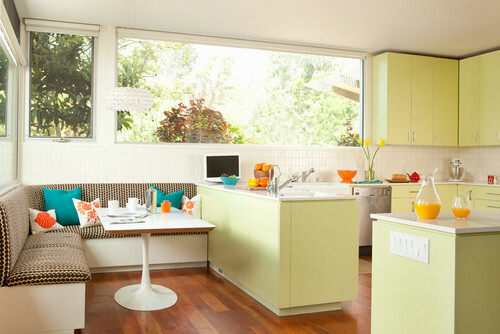 In this kitchen, color is the statement maker. A combination of colors and hues work together in a way that is bright and unforgettable but in my opinion, timeless in its own way and judging from the other artistic elements in the photo, very likeley a perfect reflection of the people who call this space home. Another option for bringing neon into kitchens and baths is by doing it with cabinetry and using a neutral stone or quartz surface for the countertop surface. 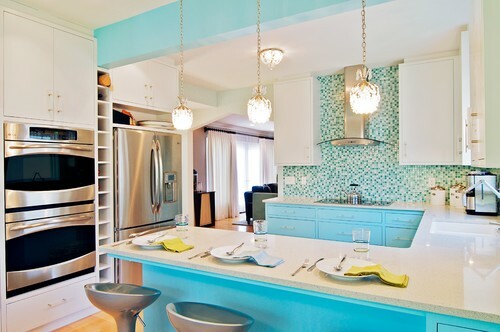 This kitchen uses a very bright shade of turquoise on both the cabinets and back splash combined with a white quartz countertop. The light fixtures and brass hardware and accessories infuse an art deco vibe that helps the space to keep a timeless appeal. 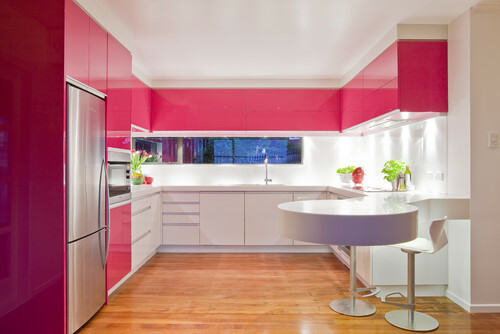 This kitchen with its round bar top and pink cabinets speaks for itself. I don't feel like I even need to talk abut whether or not it is timeless, trendy, or reflects its person. Pink is something that does all of the talking. This kitchen takes it easier with the brightness, but the idea is there and accessories take most of the credit for the neon feeling.